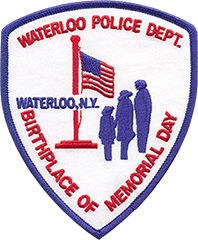 On March 1st, 2018 at about 11:21pm, members of the Waterloo Police Department arrested Joseph A. Jones, age 29, of 20 Inslee Street in the Village of Waterloo. Officers were called to Jones’ address for the report of a domestic dispute, and after investigation it was found that Jones had prevented an individual from calling 911, and had struck a child under the age of 17. Jones was charged with Harassment in the second degree (Violation), Criminal Mischief in the fourth degree (Misdemeanor) and Endangering the Welfare of a Child (Misdemeanor). Jones was arraigned in the Village of Waterloo Court and committed to the Seneca County Correctional Facility on $250 cash/$500 secured bond bail. Jones is to appear back in the Village of Waterloo Court on March 7th, 2018 at 5:00pm. The Seneca County Sheriff’s Office also responded and assisted at the scene. On Feb. 14th members of the Waterloo Police Department responded to 21 Oak Street in the Village of Waterloo for the report of a male and a female that were unconscious and not responding. Upon arrival, both subjects were found in bed barely breathing and not responding to stimuli. Sergeant Chechak and Patrolman Scaglione quickly recognized the symptoms shown as an overdose, and began to administer Narcan to both parties. Both officers administered 3, double dose, viles of Narcan to each subject which slowly revived them. Members of North Seneca Ambulance assisted at the scene and transported them to Geneva General Hospital for treatment. The life saving measures taken by both Sergeant Chechak and Officer Scaglione saved the lives of both parties involved. The Waterloo Police Department is proud to announce the hiring of the departments first police recruit. Moriah Excell is currently attending the Finger Lakes Law Enforcement Academy in Hopewell. Upon completion of the academy and training period in August, Moriah will join the ranks of the Waterloo Police Department as a Part Time Police Officer. Moriah is a graduate of Waterloo High School with an Advanced Regents diploma, she holds an Associate’s Degree from Finger Lakes Community College and is an active member of the Army National Guard. 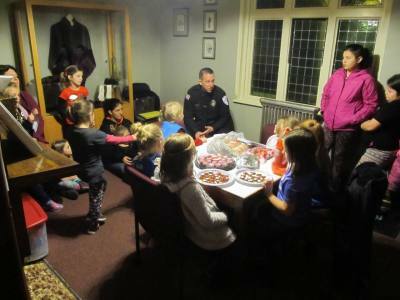 On Feb. 13th Chief Jason Godley of the Waterloo Police Department gave a presentation to a group of Daisy Girl Scouts on the importance of showing respect to authority. 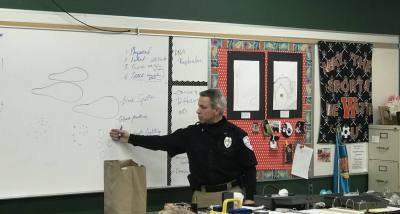 The topics covered included, identifying authority figures and proper ways to show respect to members of authority. The presentation was given at the Waterloo Library and the scout members all received coloring books and crayons at the end of the presentation. 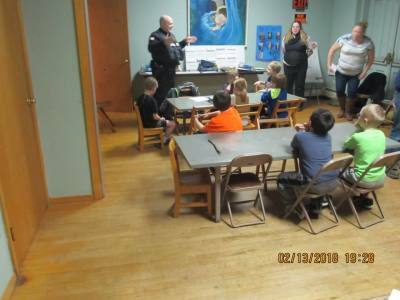 On Feb. 13th Officer Higgins of the Waterloo Police Department presented a program on internet safety to a group of local Tiger Scouts at St Paul’s Episcopal Church in Waterloo. Officer Higgins spoke of the potential dangers that can be found on the internet, ways to be safe while using the internet and what to do if encountering a problem. Each Tiger Scout was also given a coloring book that also provided information concerning internet safety. On 02/03/2018 members of the Waterloo Police Department arrested Daniel S. Ubbink for Criminal Contempt in the 2nd Degree. It is alleged that Mr.
contact the protected party several times by phone. 02/07/2018 to answer for the alleged charge. 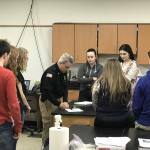 On January 31st, 2018 Officer Greg Bendzlowicz of the Village of Waterloo Police Department went to the Waterloo High School and conducted three Police Forensic lectures. The three lectures were presented to Waterloo H.S. students in Science Teacher Heather Gill’s classroom. 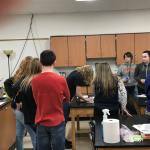 The lectures were given to two FLCC College level Biology classes and one Biology Extended 2 class. 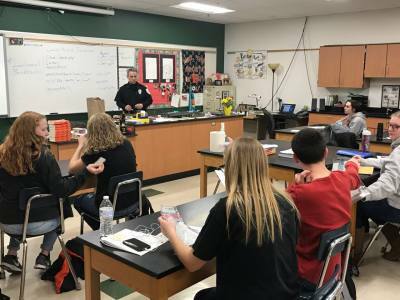 The lectures are part of an effort to expose science students to the use of science and scientific principles as they apply to modern police work. There were several topics covered such as Locards Theory of Transference as it relates to latent and patent prints and footwear impressions, trace evidence, DNA, blood spatter interpretation, processing of a crime scene and the Chain of Evidence in criminal prosecutions. Some hands on experiments were conducted. Officer Greg Bendzlowicz is a retired Detective Lieutenant from the City of Geneva Police Department with 26 years of full time law enforcement experience. He is a former evidence technician and for the last 3 ½ years he has worked part-time for the Village of Waterloo Police Department. His duties at the Village of Waterloo Police Dept. now include, uniformed patrol, evidence & property management, as well as firearms instruction. of Waterloo for criminal mischief 4th degree, a class “A” misdemeanor. physically destroyed other household items. a later date to answer to this charge. speaking to witnesses and completing their investigation that Damon M.
family after consuming crack and cocaine. (Violation), and Criminal Mischief in the second degree (Class D Felony). Waterloo Court on January 17th, 2018 at 4:00pm.